A WEEK before the furor on Rizal's green house in Calamba hit the headlines, the three of us -- Lynn, Patricia Anne (our 5th we still call Nokie, but who now wants to be called by her real name) and myself -- found ourselves staying in our national hero's hometown. Occasion was "Life Changing Smile" surgical mission arranged by the Calamba Medical Center (CMC), which is celebrating its 20th anniversary this year, in partnership with Operation Smile and the City Government of Calamba. The mission provided free cleft lip and palate operation at the 4th floor of the CMC Complex from June 15-17. Nokie is turning six next month and the speech problem she had two years ago still persists, belying earlier assurances by local and Manila-based doctors that it is just a case of delayed speech which will correct itself when the right time comes. Early this year, we brought her back to Manila and had her checked by an pediatrician specializing on speech problems; she referred us to an EENT who promptly diagnosed that Nokie's is a case of submucous cleft palate -- the outer lining of her palate is intact but the underlying muscle is not joined, which is most probably the reason why she has difficulty speaking clearly. Last year, Naga (and several other Philippine cities) hosted an Operation Smile mission but its website showed there is none scheduled for the year. There are international missions scheduled in Southeast Asia, the nearest being Vietnam, but the ones for the Philippines have been concluded last February. Fortunately, when I inquired with its Philippine office, I found out there will be three local missions scheduled for Calamba in June, and Pasay and Makati in July. Renewed hope immediately replaced my quiet desperation. The internets connected me with Dhey Nañola, CMC's bubbly marketing supervisor: first by Twitter, then by Facebook and finally by email, through which she sent the instructions and forms we need submit. It was already days past the extended June 1 deadline, and there are still data gaps and signatures by Pacol barangay officials we need to fill up. Because I have to fly to Manila for a speaking engagement and the Camarines Sur Polytechnic Colleges (CSPC) board of trustees meeting to attend to on behalf of my principals, my eldest son Ezekiel had to take care of the rest; by midday, he emailed back to me the completed two-page form, which I immediately forwarded to Dhey after pasting Nokie's 3R picture I took the night before. On June 10 and 11, Nokie had to take the blood test twice because her hemoglobin level (at 112) was quite low the first time around. After a good night sleep and iron supplements, it shot up to 119, only one notch lower than the 120 minimum but good enough that the attending pedia cleared her to undergo surgery. On June 13, she and Lynn went ahead because I have important meetings to attend to in view of the approaching 61st Charter Anniversary of the city, which will be highlighted by the launch of the Naga City Governance Institute (NCGI) which the city planning office is handling. In the late afternoon of June 15, I finally joined them at the CMC. Twenty four hours later, after calmly marching with a doctor and a nurse to the operating room, she went under the knife and emerged from the operating room about an hour later, terribly angry at the ordeal (and probably mad at the apparent betrayal of those she joined peacefully just an hour before?) with legs kicking and arms flailing at everyone. Only when her mom cried unabashly and apologized did she regain the calm and steely resolve to overcome every hurdle just so she can speak clearly and finally join her younger sister Daddy (aka Ophelia Bianca, Jian Di or Bulilit Bulilit ang Liit-liit, depending on who's calling) at the latter's Peñafrancia Educare school. The road ahead to Nokie's fully developed speech may still be long, or it can be short enough to be just ahead of the corner. I don't know: according to the doctors who briefed Lynn last June 15, the reconstructive surgery is no magic bullet for speech problems associated with children like Nokie. They have to unlearn how they now form words, and this can be difficult and will take time. But with her palate now hopefully functioning well after the surgery, I am confident that we have addressed the physical constraint to Nokie's fully developed speech. Just moments ago, after a little prodding and coaching, she was able pronounce "Papa" correctly. Needless to say, I remain very hopeful. As the world celebrates Father's Day, no gift can be greater, and for that I have to thank CMC (especially Dhey and Doctor Herbosa, who operated on Nokie), Operation Smile Philippines and the city of Jose Rizal for making it happen. 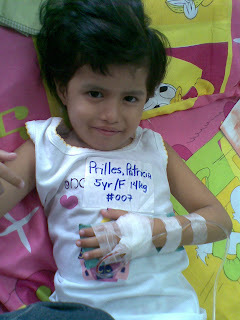 Hope she get well soon..